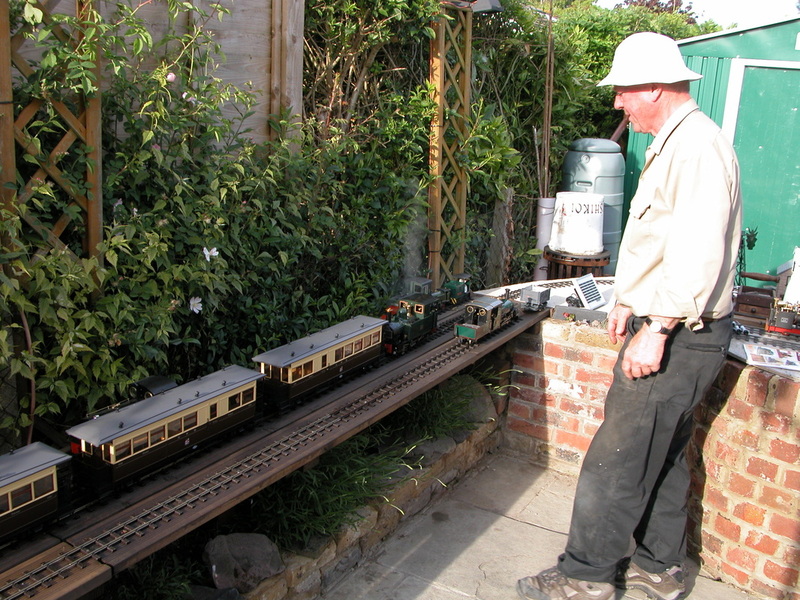 The following pictures were taken on June 6th 2014 when Geoff E had an open day to test his new track changes – mainly to ease the gradient leading up to the lifting bridge and add more storage sidings. 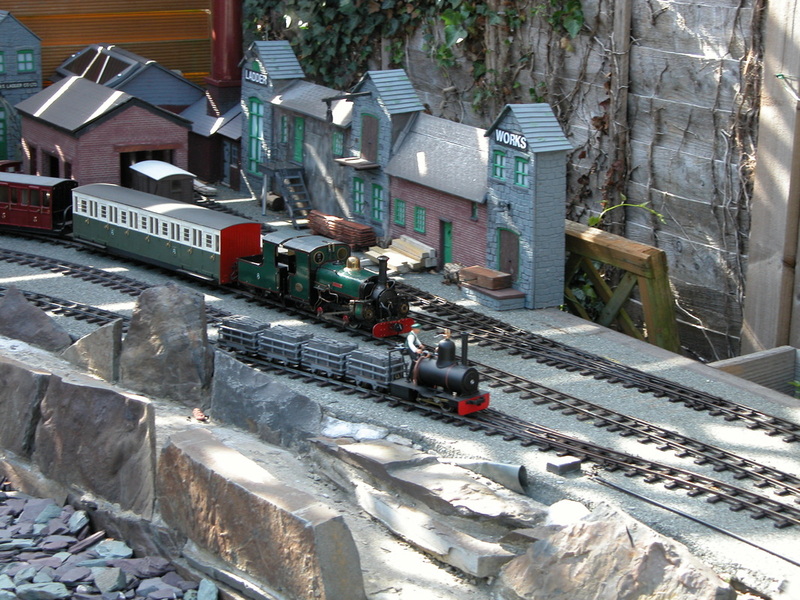 Ffestiniog Railway ‘Blanche’ with FR coaches 22, 19, 20 & van. Rule No. 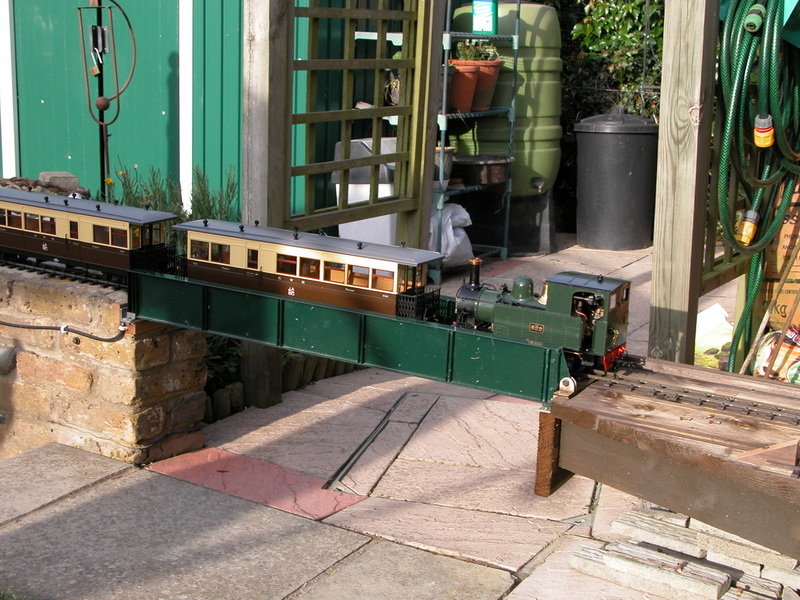 1 on this railway is "Always lower the lifting bridge after walking through". Accucraft “Countess” crossing the lifting bridge. It can be clearly seen what would happen if Rule No. 1 is disobeyed. 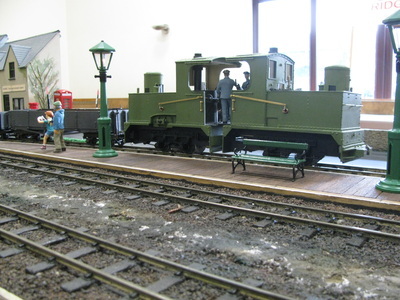 Geoff closely observing “Countess” as she tries out the new sidings. Track laying was perfect and there were no signs of any problems. 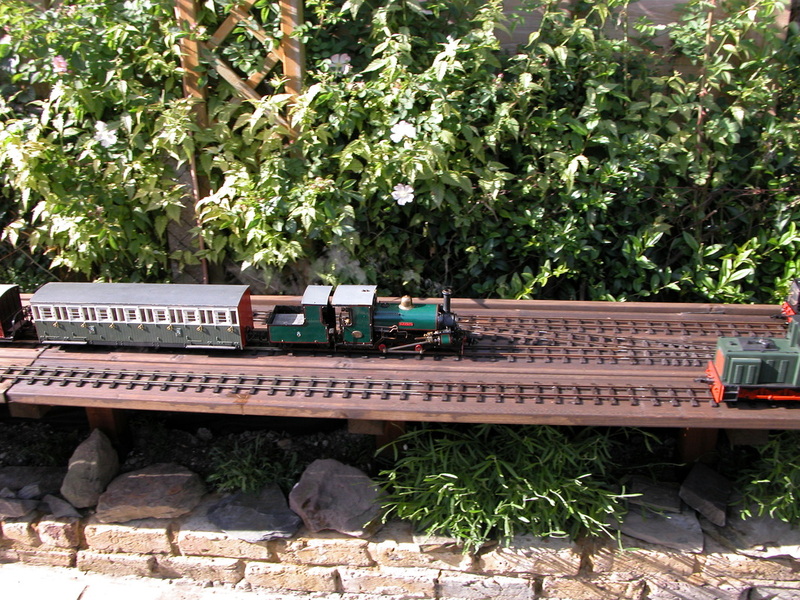 “Blanche” (behind) with Sweet Sixteen Beyer Peacock modified with full footplate detail. 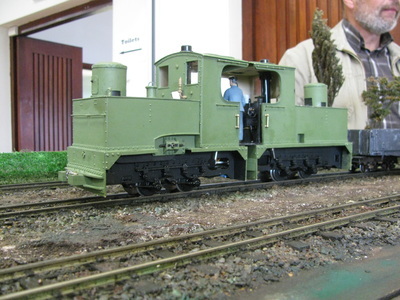 This little loco is battery/radio controlled with Deltang R/C. A Regner “Vincent”. 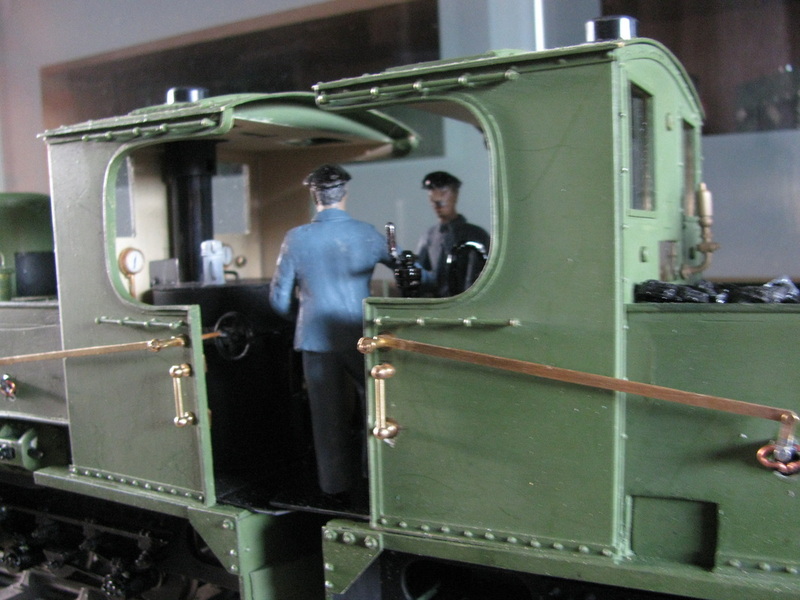 This loco is powered by a single cylinder on top of the boiler which is connected to the driving wheels by a chain. Because there is only a single cylinder there has to be a flywheel which can just be seen on the far side of the loco. 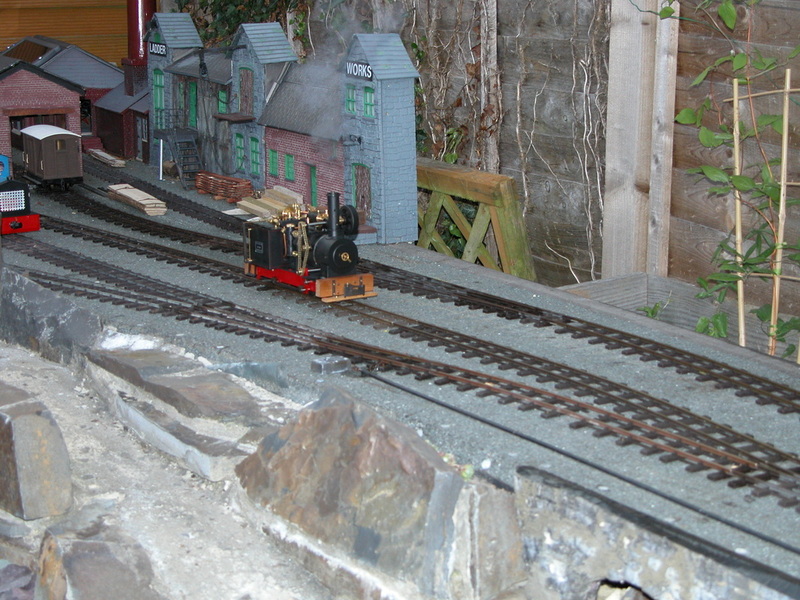 Another view of “Blanch” as she tests out the new sidings. Geoff has been busy modelling during November 2014 - here is a summary and three pictures of his efforts! Sentinel No. 6412 articulated double ended 0-4-0+0-4-0; new to Kettering Iron & Coal Ltd. 10/1926; rebuilt [as model] 1928; 80HP twin cylinder steam/geared engines, 6.75” x 9.5” cylinders; vertical boilers burning coke; 3ft gauge with 1’ – 8” dia. wheels; worked on the Thorp Melsor quarry line to the furnaces, capable of pulling 35 – 10 ton loaded ‘D’ type ex-WW1 wagons, but considered too slow so scrapped end of its life 3/60 after years of shunting in yard by furnaces. Model constructed of ‘Plasticard’ on twin Essel Eng. chassis with Como motors; 10.8V rechargable batteries; Planet T5 R/C to Viper receiver and Mylocosound sound card. 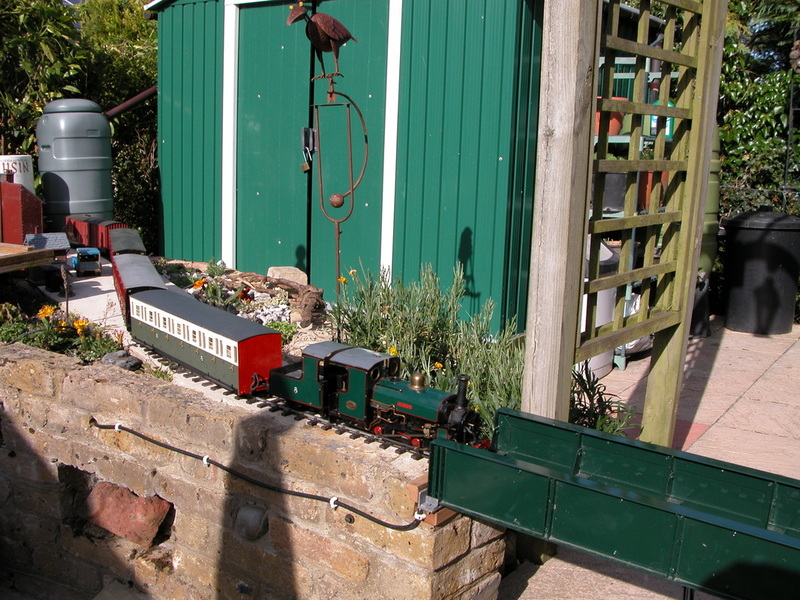 Bodies by Dan Jarvis, completion of construction and electrics by Geoff. First shown at the "Steam in Beds" exhibition on 29th November 2014 and now permanently part of the Startops & Tringford garden railway. 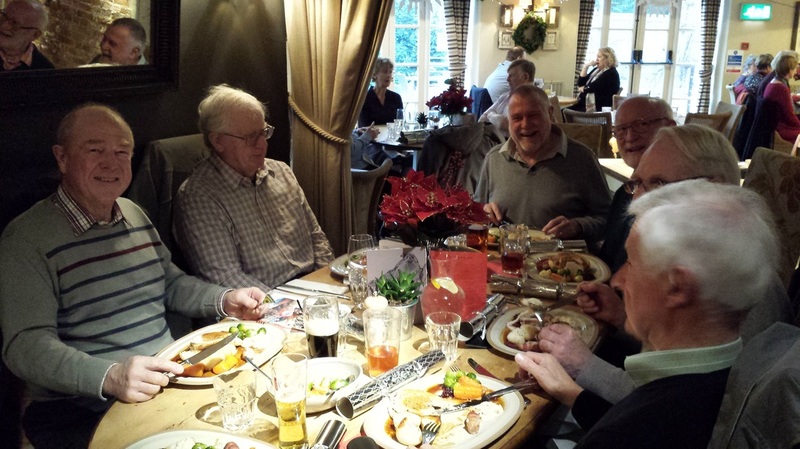 On 2nd December 2014 we held our Xmas lunch at the Bell, Aston Clinton. 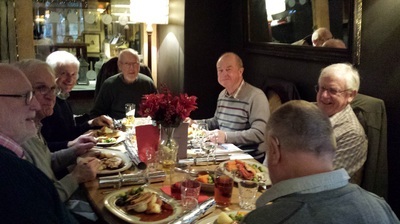 The meal was excellent and the conversation up to (and probably exceeding) our usual high standards. 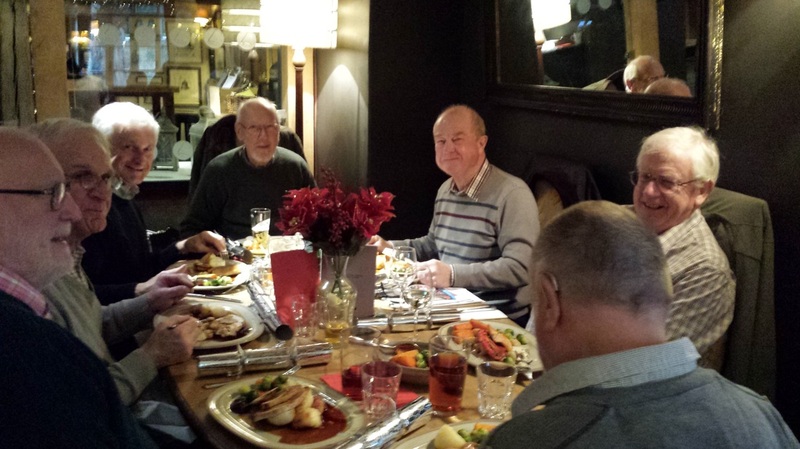 Many thanks to Keith for organising this event.